This couple's New Orleans wedding originally was supposed to take place in the evening, with a church ceremony and the reception at Latrobe’s on Royal in the French Quarter. However, Hurricane Nate forced a change in plans, with the wedding being moved up earlier in the day and the ceremony taking place in the gorgeous courtyard at Latrobe's instead of the church. However, based on the fantastic time everyone had and good spirits displayed, you’d never know that this was the “plan B”! We began coverage with getting ready shots of the girls and guys at the JW Marriott, before we headed over to Latrobe’s, where the couple had their first look on the venue’s staircase. One of my favorite aspects of this weddings related to the bridal portrait session we had done a month or so prior, at the Rural Life Museum in Baton Rouge. When the bride was little, her mom had captured some pictures of her at various spots on the grounds of the museum, and we replicated some of those shots, a few of which were displayed side by side at the reception. Kim Starr Wise put together beautiful floral decorations for the ceremony and reception, while La Louisiane provided the amazing cakes, including the perfectly rendered Blue Bell Ice Cream groom’s cake (cookies & cream, the groom's favorite!). The Bucktown Allstars, without a doubt the most fun wedding band you’ll ever encounter, provided the reception entertainment. The bride’s mom brought along a vintage trumpet that she had purchased inexpensively from an estate sale to use as a decorative item, only to learn after buying it that it was actually a valuable and highly coveted instrument. It was used as an accent piece on the wedding favor table at Latrobe’s, but she was thrilled when one of the band members played it for a few songs! At the end of the event, the band led everyone around the venue for a fabulous second line parade, wrapping up a wonderful and unforgettable wedding. This city is blessed with many unique and historical venues for weddings. 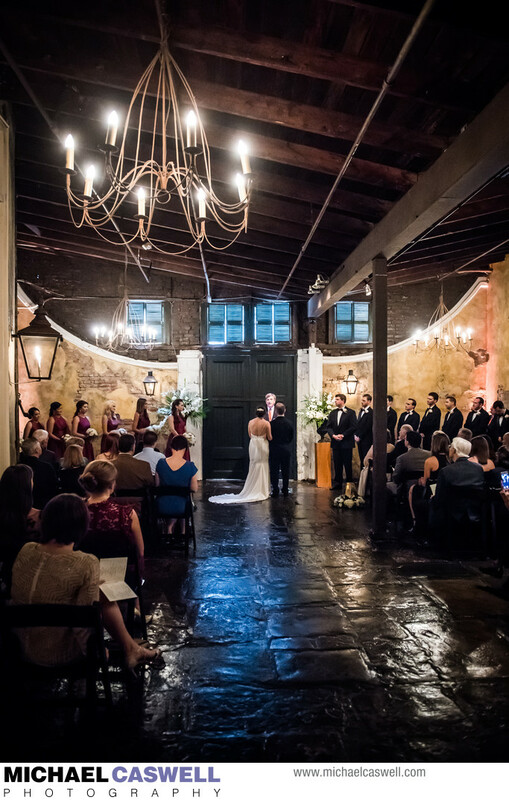 Latrobe's on Royal is at the very top of that list, a fantastic New Orleans wedding venue in the French Quarter that has lots of character and is just oozing with historic ambiance. The building, originally the Louisiana State Bank, was designed by Benjamin Latrobe, who is best known as the architect of the United States Capital building. Wedding ceremonies at Latrobes typically take place in the courtyard, which has long since been converted to a fully enclosed and air-conditioned space from the traditional outdoor courtyard it was originally. This amazing and unique room looks just as gorgeous in person as it does in photographs, with warm, subtle lighting, lots of natural exposed wood, and visually stunning textures and colors on the walls. Most of the reception action at this venue usually occurs in the main ballroom, which is toward the front of the building facing Royal Street, but after the ceremony the courtyard will typically be cleared and set up as a secondary reception space. This is a nice arrangement, as it allows for a quieter place for guests who wish to engage in conversation away from the loud music and action on the dance floor. What was once the bank's vault now serves as the venue's main bar. If you just wish to have your reception at Latrobes, the venue also benefits from a convenient central French Quarter location that is within easy walking distance of popular ceremony venues such as St. Louis Cathedral and Jackson Square. And of course you can always choose to transport your guests from another New Orleans area church to the French Quarter. Location: 403 Royal St, New Orleans, LA 70130.